Giveaways Coming to a Close! Did you know there are some super cool giveaways going on? 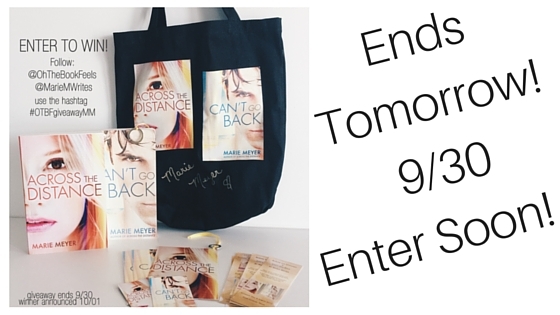 That’s right, ACROSS THE DISTANCE and CAN’T GO BACK are featured in some giveaways floating around the interwebs! But these giveaways are expiring sooooon, so get entered so you have the chance to win cool stuff! Have you “Liked” my Facebook Author Page–Author Marie Meyer? When I reach 500 Likes, I will choose a random follower who will win a digital copy of both ACROSS THE DISTANCE and CAN’T GO BACK!